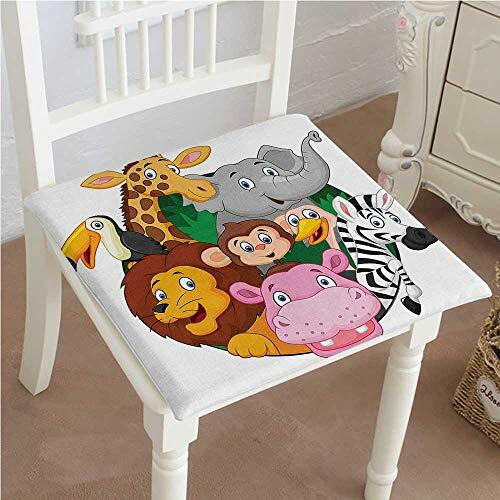 Mikihome Chair Pad Soft Seat Cushion Exotic Safari Animals All Together Comic Creature with Zebra and Elephant Friend Trek Expandable Polyethylene Stuffed Machine Washable 30''x30''x2pcs by Mikihome at Animal Backgrounds. MPN: YZD-15-0823-11942K75xG75x2pcs. Hurry! Limited time offer. Offer valid only while supplies last. Waterproof seat protectors are made of durable eco-friendly polyester pongee protect your car seat, chairs, house, etc from dirt and spills.